As we noted on the blog last week, 2016 has been a fairly turbulent year for publishers on Facebook. While engagement and use of social media generally has never been so high, publishers found it a little harder to get noticed in news feeds, and were asked questions about the relationship between their social presence and their own websites. Despite that, there have been lots of great examples of publishers engaging with their readers (and viewers) in imaginative and innovative ways. We didn’t pick these publishers on the basis of overall engagement alone. While consistently high engagement was a factor in deciding the winners, we looked for an overall pattern of content format experimentation and success. We’ll keep analyzing social distribution throughout 2017. To make sure you stay ahead of the curve, subscribe to our weekly newsletter. In a year where attracting Facebook engagements on website content proved tricky at scale, the Huffington Post defied expectations. After being briefly usurped from the top spot in June, the Huffington Post surged back clear into the lead the following month, adding 3.6 million engagements to their monthly total from June. As usual, their biggest stories were personal posts. They’re consistently up at the top of our top Facebook publishers rankings, a constant presence since we started looking at the most engaged publishers on the platform in late 2013. As we noted in a post earlier in the year looking at what makes for a successful Facebook headline, their most successful stories on Facebook ‘take the unique part of the personal approach and make it relatable for readers.’ Our data also shows that the Huffington Post are doing very well in terms of election coverage on social media over the last six months. Tackling the challenges for publishers on social, the Huffington Post are staying on top of their audience in a serious way. For the Washington Post, 2016 was a banner year online. The site passed 100 million visitors in October, an all-time record and almost a 50 percent year-on-year rise. On Facebook too, those gains were evident. The site recorded a strong year for engagement on the platform, climbing high in our monthly rankings on a number of occasions. While there was plenty of opportunity for news-focussed publishers on social media this year, the Washington Post made the most of things. In one month alone, from July to August, they increased Facebook engagements on website-based content by almost 25 percent. 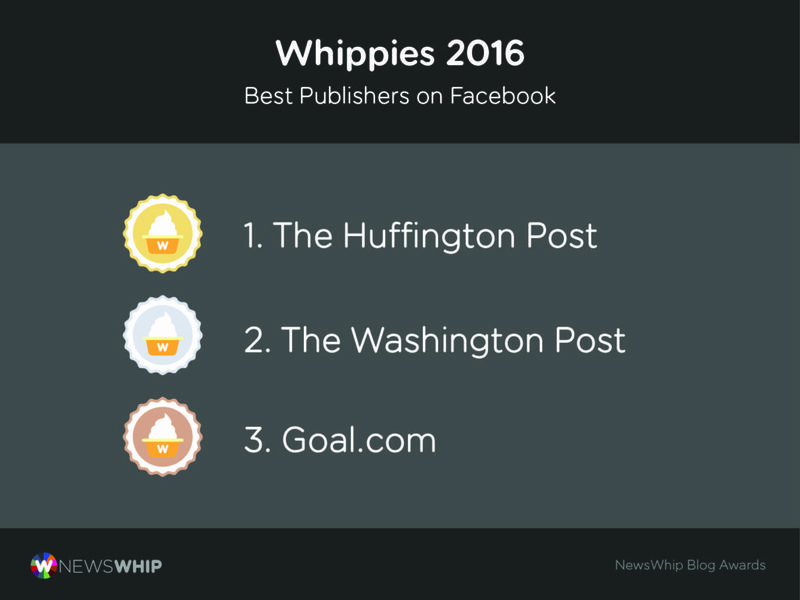 In 2016, the Washington Post made bold strides to get the most out of Facebook. The site went all-in on Instant Articles, pushing their content in front of extra eyes and into new news feeds. Meanwhile, while their content itself has been broad, the Post’s traditionally strong political coverage makes up many of their most engaged stories and posts on the platform. Many of their journalists regularly update their own pages with specific content themes, and have also been using Facebook Live regularly. The Washington Post shows that there’s room for legacy publishers to reinvent themselves on social media. Goal have placed strongly in our rankings throughout the year, but the culmination of the Euro finals in July helped push them to their highest placing yet, in second place overall. Goal produces an enormous amount of articles each month (almost 26,000 English language posts during July), and a very engaged Facebook audience, broken out into numerous pages, helps boost activity substantially. Goal also shows an interesting model of granular audience development on Facebook. Their sports fanbase helps them reach very targeted fanbases, and with algorithmic changes pushing publishers in the direction of more personalised niche content, it’s a strategy that other publishers will likely be looking to emulate in 2017. Look in the comments threads of Goal.com posts from their myriad pages for local teams, and different countries, and you’ll find plenty of passionate discussion amongst football fans. In 2016, Goal showed that a major global publisher can successfully have a local presence on social media. The National Geographic has a formidable presence on Instagram, with over 65 million followers on their flagship account. Our database puts them as the number one most ‘liked’ publisher on Instagram since June 1, with over 690 million likes alone on their posts since then. That puts them ahead of major Instagram presences such as Cristiano Ronaldo, Justin Bieber, and the NFL. But it isn’t just engagements alone that drove National Geographic to the top of the pile. Their content strategy on the platform is enviable, and illustrates the range of the audience that publishers with access to strong visual assets can achieve with Instagram. With a healthy number of active daily users, Instagram is certainly a platform to watch for audience development. From a publisher perspective, there’s no better model than the National Geographic. When we recently looked at the rise in engagement with publisher content on Instagram, we found that Fox News managed to increase engagement on their main Facebook page by almost 200%. That’s impressive engagement for Fox, who developed a strong community in a busy year in US politics. How did they do it? We think there’s a number of factors. First, Instagram’s rising numbers of active users exposed more and more publishers’ content in their feeds. An algorithmic change in June may also have had the effect of surfacing more posts that were being actively engaged with. Breaking News: #JohnGlenn, the all-American #astronaut and senator who rocketed into history on flights 36 years apart as the first American to orbit the #Earth and the oldest person in #space, has died. Our data showed that Fox had made much use of Instagram’s extended video clips, uploading 89 videos in September, up from 10 in January. Average engagement rates on those posts were pretty high. Plus of course, the election probably had a role to play. At the end of 2016, Fox News is one of the most engaged news publishers on Instagram. Like Goal.com on Facebook, ESPN can thank a very devoted fanbase for its success on Instagram. Their Instagram feed is a ticker feed of sports highlight from important games, as well as news updates. ESPN post very regularly on Instagram. They posted almost 700 times in the last month, making sure their posts stay relevant to their followers in crowded feeds. It’s this consistency of output that helps their numbers, as well as the posts themselves. As well posting the popular game highlights, the ESPN team also use Instagram as a means of adding context and crucial numbers for sports fans. Captions are short and to the point, reaching their readers in the terms they’re already familiar with. And there’s no shortage of action footage. Like National Geographic, ESPN reside in the very upper echelons of engagement on Instagram generally, not just for publishers. ATTN (pronounced ‘Attention’) was a very visible presence on many news feeds this year. Its founders say that its mission is to make social issues easier to understand for a millennial social media audience, specifically through the medium of Facebook videos. And they’ve managed to make some significant engagements since they launched. Our data shows that their main Facebook page had around 4.7 million engagements on new content in November, with some of their most popular posts attracting hundreds of thousands of shares. Bu Facebook videos aren’t the only types of posts that they’ve seen success with: their website articles have also been seeing large volumes of engagement, perhaps signaling that they’ve struck a sweet spot in terms of coverage and delivery. Certainly one to watch in 2017. This time last year, Insider changed its focus from another general news page to target “people who seize life rather than letting it happen to them,” says editor Nicholas Carlson. Business Insider’s native channel, Insider, got a website of its own this year. But it still isn’t the main focus for the new outfit. Insider was conceived as a wholly distributed channel, and their Facebook videos get enormous engagement each month. Much of their success comes from smartly editing longer, more complex stories into a short clip. Their lifestyle coverage and tips are made to be shared, and viewers have been doing so in droves. We recorded them having 4.1 million engagements on their main Facebook page in November, and many more on their various sub-pages, such as Insider Food, Invention and Design. Great Big Story are a social native publisher looking to bring the feeling of long-form content to a mobile and social audience. That sounds tough, but by focussing on unique stories and quality production, the Turner-owned outfit succeeded in 2016. “It’s a little bit liberating. For one thing, you don’t have to worry about becoming a destination. With delivery systems like Facebook, we are able to focus more on the substance and delivery of the content, rather than the distribution. Before Facebook, when we used to create things and digitally distribute, we worried more about the relevance of a specific piece. By going after the less obvious stories on social, GBS seem to have developed an audience of their own. What were your favourite publishers on social media this year? Let us know on Twitter. Liam Corcoran is Head of Communications at NewsWhip. His analysis and opinions on news, publishing and social media are regularly featured by the likes of AdWeek, BBC, Business Insider, Digiday, Huffington Post, Mashable and Wall St Journal.